It's no secret that the family is under attack. According to Pope John Paul II, "In a world that is becoming even more secularized, the great task of the believing family is to become conscious of its own vocation and mission." Today's Catholic parents need to know: How do you chart a safe course for your family through the murky waters of modern culture? How do you recognize the many opportunities for growing in holiness offered by your "domestic church"? What can you do to make sure your kids stay Catholic? What makes a "successful" Catholic father? Now on four CDs, Saint Joseph Communications has gathered four respected Catholic speakers to take on the challenge of facing the facts about faith, family and fatherhood. The first presentation is from well-known author, radio personality and former host of EWTN's Life on the Rock, Jeff Cavins. You'll discover the profound impact that your family can have on our society when you begin to recognize your family as a place of sacrifice. You'll appreciate the intimate and candid way that Jeff offers examples from his own family life to show you how to take advantage of this crucial spiritual principle. Artist, novelist and acknowledged expert on culture and religion Michael O'Brien shares the importance of forming our children in a genuine culture. In the face of the relentless onslaught of movies, TV, videogames, etc., you'll discover how to recognize and resist the negative influences of secular culture on your kids without becoming "paranoid" or "alarmist." And, at the same time foster in your children a true Christian imagination. Finally, Jim Stenson, a Catholic educator of the "old school" shares his extensive experience with Catholic families and the formation of their children. An astute observer, Mr. Stenson distills decades of personal experience to discern for you the qualities and characteristics essential to become a successful Catholic father. In an era when men spend so much time and effort on their business relationships, its more important than ever to put the right emphasis on a man's most important relationships - with God and family. This series should be essential listening for every Catholic parent. 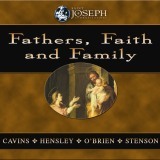 Purchase your copy of Fathers, Faith and Family today and start on the road to more effective, more successful and most importantly, more Catholic parenting. Why Catholic Americans may be "amusing ourselves to death"
What is the real meaning of "culture"
How your family should respond to Our Lord's call to be "in the world, but not of the world"
Footsteps of Faith 8th Annual Biblical Studies Conference: "The Body of Christ"